LA PAZ – Bolivian President Evo Morales said Wednesday that the United States “doesn’t have the authority or moral standing to question” his country’s battle against drug trafficking and he urged Washington to offer an accounting of its own anti-drug efforts. Such was Morales’ response when asked at a press conference about a U.S. State Department report citing Bolivia for having failed to demonstrate its commitment to international counter-narcotics accords. Bolivia, the president told reporters, is committed to a “all-out battle” with the drug trade, even though the U.S. government no longer provides anti-narcotics aid to La Paz. Morales said that Bolivian authorities have seized 19.4 tons of cocaine and coca paste so far in 2009, compared with 11 tons during all of 2005, the year before he took office. Bolivia’s interior ministry says that police have also destroyed 3,709 drug laboratories since Jan. 1. The president stressed that all of those operations were carried out without any help from the U.S. Drug Enforcement Administration, which he expelled from Bolivia late last year after accusing DEA agents of engaging in unauthorized activity. Downplaying the importance of the U.S. government’s annual evaluations of other countries’ performance in the war on drugs, he said that Washington used political considerations when deciding to label nations as cooperative or uncooperative. He then asked why there is no certification of whether the United States is reducing its demand for illegal drugs. “As long as there is a market for cocaine, however much we reduce coca leaf, part will always be diverted (to cocaine production): that is our reality,” the Bolivian president said. “The struggle against drug trafficking cannot be an instrument of political control and geopolitical control,” Morales said. 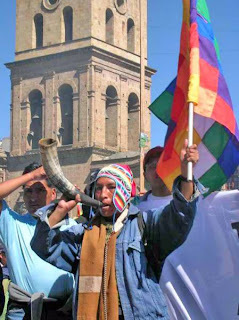 Bolivia, like neighboring Peru, allows cultivation of coca in limited amounts to meet demand for legal, traditional uses in cooking, folk medicine and Andean religious rites.